I couldn't sleep last night. So, around 2:30AM, even though I have to go into work later this evening, I decided to go back and try again. I set up in the same spot I hunted last time. The turkeys were roosted in same spot as yesterday morning. I had four toms gobbling back at my calls. The toms to the left pitched down in the field on the other side of a small ditch. I could just barely see them through the trees. I could see they were both puffed up so I figured there was a hen with them. I just played aggressive and called every time they gobbled, hopifg they will remember I'm here later in the morning when that single hen gets sick of their attention. Well, I didn't have to wait long. I could see a black blob walking around the line of trees toward me. I'm guessing he was the less dominate tom and figured he wasn't going to get anywhere with the hen, so he came over to me. It took him a while to cross the distance, because he would stop and strut every minute or so. It made me nervous every time he did because I thought he was going to hang up out of range. But eventually he just couldn't resist the chance for love and I had to put an end to his courting. He was the smallest bird I got this year. 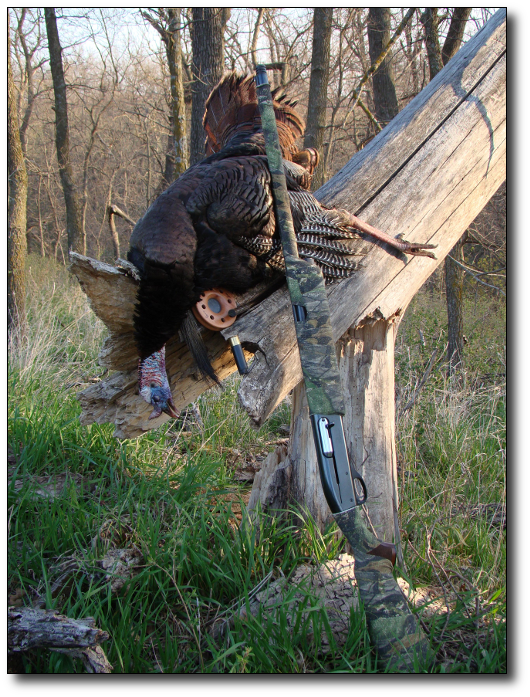 He had a 9 1/2" beard and 3/4" spurs. This is the first time in about twelve years of turkey hunting that I tagged out in both KS and MO. Usually I'll get two birds in one state and one in the other.